simplyasep.com First Lieutenant (First Lieutenant) (Pilot) Yoga "Grimlock" Kertiyasa managed to make a proud achievement by winning 1000 Flying Hours (JT). 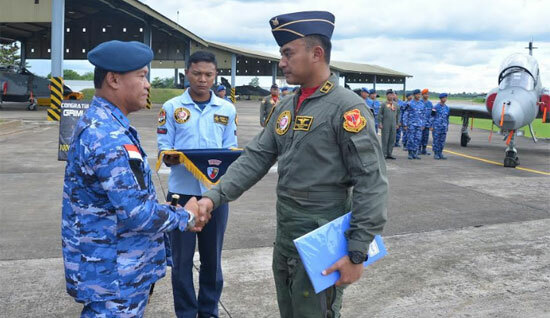 The First Officer (Pama) who is an Alumni of the Indonesian Air Force (AAU) in 2012 is a fighter pilot of the Hawk 100/200 Air Squadron 1 Wing 7 Supadio Airport. Danlanud Supadio appreciates and congratulates the First Lieutenant of Yoga who has succeeded in reaching 1,000 flight hours and to all Air Squadron 1 personnel for their success and support so that all training and mission can be achieved smoothly and safely. 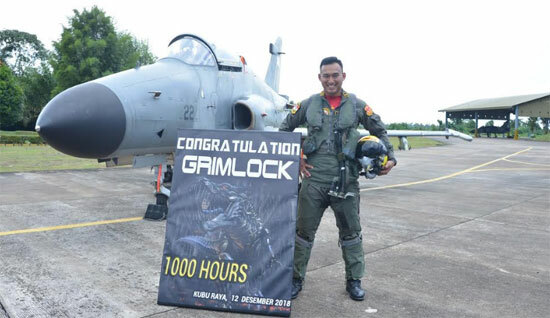 Marsma TNI Minggit Tribowo, S.IP congratulate on the successful of First Lieutenant (First Lieutenant) (Pilot) Yoga "Grimlock" Kertiyasa managed to make a proud achievement by winning 1000 Flying Hours (JT). "The success of a pilot in achieving 1000 flight hours is a matter of pride for individuals, families and units. And for pilots achieving 1000 flight hours it is important that a pilot is able to carry out safe tasks and a high level of professionalism and successfully apply the training program provided by the instructors and his seniors well, "said the Danlanud. To get 1000 hours of flying, continued Danlanud, of course it is not easy, because it requires hard work, high dedication, excellent health and always honing flight skills and of course supported by aircraft readiness. "In this opportunity, I hope that all flight and ground crew personnel, in carrying out aircraft operations, are still guided by established guidelines and procedures. Likewise with safety factors so that they remain prioritized and carefully examined, so that the things we don't want can be avoided, "explained Marsma TNI Minggit Tribowo, S.IP.